"I have come away from Peru feeling like I’ve seen almost all of the most popular places in the country. The trip fit a whole lot of experiences into a 10-day itinerary and I would say that it was certainly good value for money! " South America appealed to me as it was one of the only continents I had yet to visit and the images you see of Machu Picchu really ignited a desire to experience this iconic site for myself. I’ve spent a lot of my life travelling and have visited many Asian countries, even growing up in Hong Kong. In the past few years, I have been travelling solo, discovering as much of the world as I can. Before I saw the Exoticca offer to Peru, I was planning on going to Jordan, but once I realised what good value for money the Peru trip was, especially considering the small single supplement, I decided it was too good an opportunity to pass up. 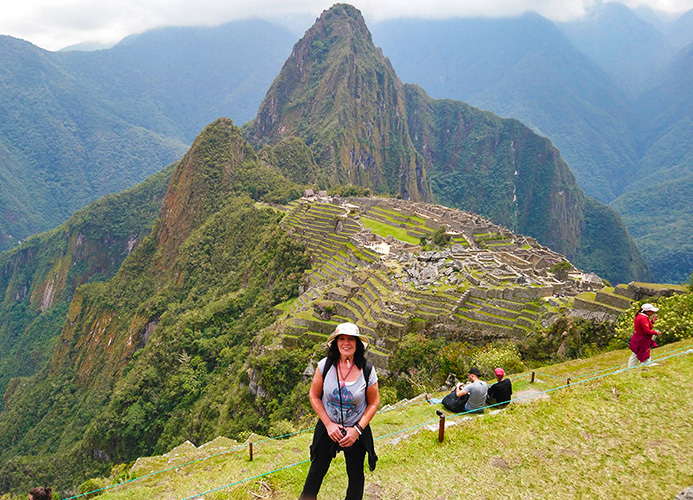 I expected to be ‘wowed’ by the ancient Inca sites in Peru and I also hoped there would be similar people travelling on the trip, as it’s nice to meet other travellers on these kinds of tours, especially when travelling solo. Arriving in Lima I was pleasantly surprised to have been upgraded to the Courtyard Marriott hotel, which was of a very good standard and well situated for discovering the city. I really made the most of my time in Lima, which had a delightful atmosphere and is full of restaurants and bars. 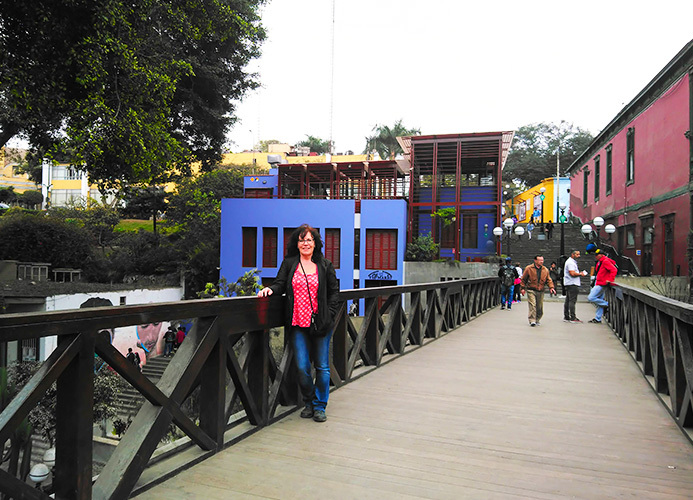 The organised city tour gave us a good overview of Lima and from there we were free to discover at our leisure. I walked absolute miles on my own, across the cliffs which overlook the Atlantic, to the town of Barranca, having heard it was a vibrant bohemian area. I felt safe and confident to get out on my own throughout my time in Peru and loved the element of freedom that the itinerary allowed for, giving me the time to explore independently. The group experience was good and there were a lot of different people to chat to, as the group was quite large, although we were often split up into smaller groups for the tours. I found most of the guides to be friendly and informative, especially Jimmy who showed us Machu Picchu. Of course, travelling across a country does involve a fair amount of time spent on the coach, but it was comfortable and we made lots of stops along the way. Travelling in this way also showed me many different sides of Peru as you pass through villages and towns, set amongst beautiful landscapes. 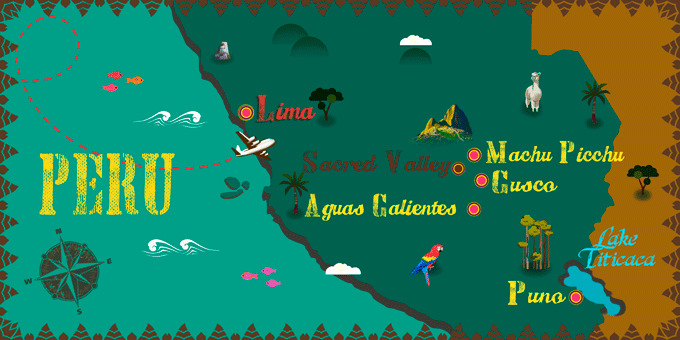 From Lima, we flew to Juliaca, situated near Puno and home to the famous Lake Titicaca. I really did not know to what expect from the world’s highest lake, but I was looking forward to visiting the lake and the group and I were lucky to have glorious sunny weather on the day we went island hopping. We took a boat trip on the glistening water and visited both the Uros and Taquile islands, where people live very traditionally. The locals welcomed us into their homes and explained their way of life, which is heavily dependent on fishing and cultivating crops on the lake. It is an amazing place, especially when you consider that the floating islands are built and maintained by these small communities. There were a lot of tourists taking similar trips to us on the lake, and although this is not always ideal, I imagine that the communities that live here will not be around forever, as younger generations move into the cities and towns on the mainland, so visitors are eager to experience Lake Titicaca while they still can. It is worth mentioning that Puno sits at around 3,800 metres above sea level, and things are quite different at this altitude. I did feel a little wobbly, which is only natural, but made sure to drink plenty of the local ‘coco tea’, which is said to alleviate these symptoms and also tried to take it easy and give myself time to acclimatise. The sunshine can be very strong at altitude and I would recommend a good sun hat, especially for the excursion on the lake. In general, the weather is extremely changeable and although it can be chilly in the mornings and at night, once the sun comes out it can get hot! Visiting Machu Picchu was the highlight of the trip and it felt good to be ticking off one of the world’s top destinations. There were hundreds of other people at the site, but after taking some photos I took a moment to just stop and take it all in and it is honestly something I’ll remember for the rest of my life. When you arrive, you follow a short trail that leads you to a clearing and in front of you is the ruins of the ancient Inca site, like you see in the photos. The group and I had travelled by train from Cusco, up to Aguas Calientes, to spend the day at Machu Picchu, and after visiting the site we spent the night in this buzzing little town, which had a lot going on and a good atmosphere. There was a Peruvian election taking place during the time I was in Peru and it was interesting to watch all the locals involved in the events, waving flags and playing music in the squares, especially in Aguas Calientes. The next afternoon, we headed back down to Cusco where we were scheduled to have a couple of days to spend at our leisure. I had opted for a Sacred Valley tour on one of the days, where I felt I gained a great insight into the local cultures, especially of those people who live very rurally in Peru and I also enjoyed the landscapes of the valley. For the last day, I had planned to enjoy some action-packed sightseeing and mapped out my route to get the most out of my final hours in Peru. I visited four museums on the last day, including the Chocolate Museum, which showcases the history of chocolate production in the area, as Peru is famed for the quality of its chocolate. I ended the day at the San Pedro Market, where there was plenty of beautiful things to buy, but I barely spent anything whilst I was away, so you could certainly visit on a budget! I ate the local food throughout the trip and loved all the flavours, especially in the ceviche, a fresh fish dish with lime juice, typical of Peru. Now I’m back home, I feel like I gained a unique insight into life in Peru and loved seeing how different things can be at altitude. It’s truly impressive how people live in such remote mountainous locations and I loved it when we were driving along and I could gaze out of the window and watch communities going about their daily lives. I also noticed that Peru’s population is a very varied mixture of people from different backgrounds, which all contribute to the unique nature of the country. The country has successfully retained its cultural roots and wherever you go you’ll see people in traditional dress, especially the older ladies in their bowler hats found relaxing outside in the historic ‘plazas’, the best places to people watch! When you are on a group tour holiday, you always end up speaking to others about their past travel and future travel plans and after experiencing Peru I feel inspired to delve deeper into South and Central America, especially destinations like Brazil, Chile & Argentina, popular amongst the other travellers I spoke with. I have come away from Peru feeling like I’ve seen almost all of the most popular places in the country. The trip fit a whole lot of experiences into a 10-day itinerary and I would say that it was certainly good value for money! Sampling the local cuisine is a great way of experiencing the culture and it is also always fun to try new things! On the last day in Cusco, I really enjoyed visiting the sights and museums, managing 4 museums in a day. I only took a carry-on bag on the trip and packed lots of layers as the weather is very changeable in Peru. In the morning it can by only 7 degrees Celsius but by the afternoon it might be as hot as 27 degrees! Travel to Peru cannot fail to evoke images of a legendary past, as many attractions are associated with the hidden city of Machu Picchu. As attractive as the Incan city may be, however, Peru offers so much more. An imposing landscape that runs from the Andes to the Pacific Ocean, where you will discover a land of indigenous traditions.